The Rockies may have dropped their first series of the season to San Francisco, but they sure as hell weren't going to be swept. -- The offense really provided a great lift, scoring just as many runs today (6) against Cain as they did in his four starts against them last season. Obviously Cain wasn't at his very best, but I didn't really think he was bad either. The Rockies offense just took it to him. They did what made them successful on the road trip, and that's maximize their scoring opportunities. A pair of four run innings certainly bears that out. -- The biggest swing came from Ty Wigginton. His three-run second inning homer, which was also his 1,000th career hit, was the big hit the Rockies can never seem to find against Cain. Wigginton also had the two-out, three-run double in Pittsburgh which is a big hit the Rockies can rarely find on the road. What I'm saying: Mr. Wigginton has been a fantastic addition even if the average doesn't overwhelm you. -- Nice job by Jorge De La Rosa to minimize the Giants first inning damage today. They did score one, but it looked like it could be a three-peat of the last two games. He put an end to that, and then pitched aggressively and effectively with a nice lead. His final line: 7 IP, 4 H, 2 ER, 2 BB, 6 K. That's as Rock Solid as it gets. -- It could be time for Seth Smith to shed the Mr. Late Night nickname. It's a fun one to be sure, but he's a starter now, and he's hitting at all hours of the day. -- Really impressed with the at-bats Jose Morales takes. Working counts. Driving pitches the other way. Looks like he may strike out quite a bit, but doesn't do so without putting up a decent fight. Really nice guy to have as a backup. -- Carlos Gonzalez looked pretty lost against lefties Dan Runzler and Jeremy Affeldt late in the game. He was bailing on some pitches and just looked really uncomfortable. His reactions after both at-bats tell you he's fighting it mentally. Hopefully he finds a good answer to his problem during the off day. -- Troy Tulowitzki had a very professional day at the plate. Three hits, three runs scored. Didn't look like he was thinking about hitting that 100th career home run, just looking to find a way on base and help his team that way. -- Ryan Spilborghs came through with the three-run homer the Rockies could have used last night down three. The home run extended the lead from 7-2 to 10-2. Oh well, like I tweeted when it happened, he needed it more than the team did. Hopefully it'll jump start him on a hot streak. 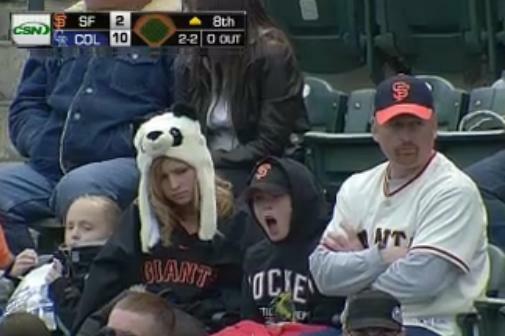 -- And we'll just call it a day with this wonderful screencap courtesy CSN Bay Area.